Distribution of the 38s is continuing with 60% of orders now filled. 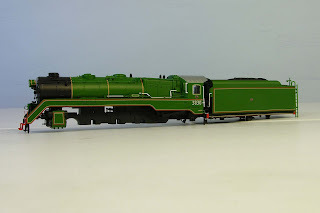 The response to the release of the model has been nothing short of overwhelming and the stage has now been reached where the only locomotive numbers that we have available for sale are 3801 (in green) and 3830 in both sound and non-sound models. Remaining stocks of all other numbers are required to meet existing orders. The factory has advised that the sound board for the CTH trailer is now underway and as soon as it is finished it will be installed in the already completed trailer car and the finished CPH/CTH set dispatched from the factory. No delivery date has been supplied yet but it will be after Chinese New Year. The reasons for the delay involves the separate decoder which is being installed in the CTH trailer car. This is a single function decoder which will provide control over the CTH car's internal lights and will allow DCC users to turn the internal lights on and off using a DCC function. There apparently was some problems between the factory and the supplier of the chip and these had to be resolved before manufacturing could proceed. This has now been done and final manufacturing and assembly is proceeding. More later when a definite delivery date is available. As of today 25% of total orders have been filled and steady progress is being made on posting out the remaining orders. Anyone wishing to check the status of their order is welcome to contact us for details. The response to the 38 has been nothing short of overwhelming. 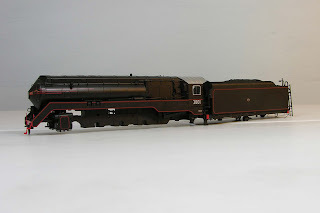 We normally try to order what we think will be sufficient units in the first production run to keep the model in stock for 12 to 18 months however, such has been the response that in non-streamlined units 3809 in black and 3820 in black are now sold out. 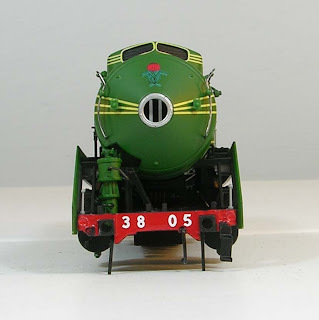 In streamlined units 3805 in green is now also sold out. We have reasonable stocks of 3801 and 3830 but stocks of 3813 and 3827 are getting low. Three van loads of 38s arrived at the Eureka office last Thursday and after a day sorting things out distribution commenced. A mixture of pick-up and postage has resulted in about 10% of orders on hand being filled by close of business tonight (Tuesday). We are a little bit overwhelmed by the response to the 38s to date but we will be concentrating on maintaining the above distribution rate until all existing orders are filled. The motor vessel carrying the 38s is scheduled to arrive in Port Botany on the 15th of October. Allowing time for customs clearance, distribution should commence around the 20th. There have been some significant changes at the factory of late and with a number of projects currently underway needing attention it was decided that some face to face contact was overdue. In what was to be a very quick visit we headed north last Wednesday (after a seven hour delay getting away due to a sand storm), visited the factory on Thursday and Friday and will arrive back in OZ on Saturday. This dispatch is being posted from our hotel in Hong Kong as we could not send it last night from our hotel on the mainland as international blogs cannot be accessed on the mainland. This was one of the most challenging meetings that I have had at the factory and as time permits some of the matters discussed, particularly those relating to projects underway will be reported on either here on this blog or our web site. PS. I understand that the air shipment of 38s arrived in Sydney whilst we were away and we will take delivery on Tuesday. 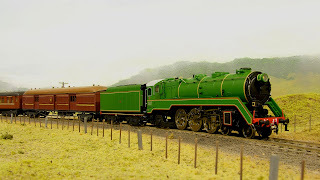 Here are photos of two of the streamlined models due to arrive in port about 20 October 2009. The front shots show the hook and link couplers as on the original, these may be removed and the supplied metal Kadee style clone coupler can be easily substituted. The factory forwarded a further 23 models (one of every variation) today and we will have them tomorrow (Tuesday). 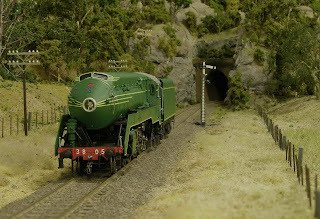 Will try to get more photos up this week especially a streamliner. 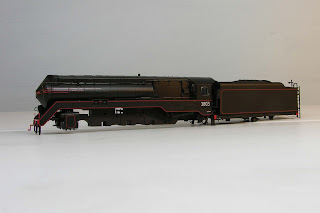 Here is a photo of 3827, one of the seven production models air freighted out of China. Some more photos will be posted on the Eureka Models web site later this week. Click on the photo for a closer look. Seven 38s from the production run arrived today from the factory which confirms that the September 20th dispatch date should be met. 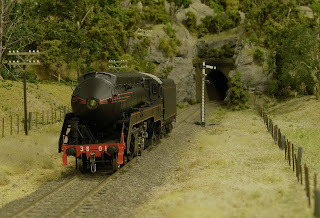 The models will be photographed and posted here and on the Eureka web-site. Advice from the factory is that the 38s will be available for shipment on the 20th of September. Allowing for sailing time and clearance through Port Botany the 38s should be in hand around the 20th of October. The sailing date of the vessel carrying the 38s should be available within the next two weeks and this will allow a more precise date for their arrival at Port Botany to be calculated. There is no official news yet on delivery of the 38s from the factory although they have advised that assembly is underway. 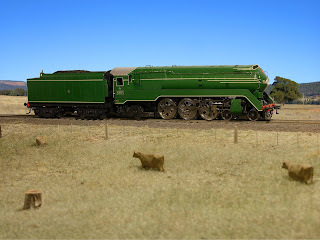 We are pressing the factory to have the models at Port Botany by mid-September in time for the Liverpool exhibition but they are not guaranteeing anything at the moment. 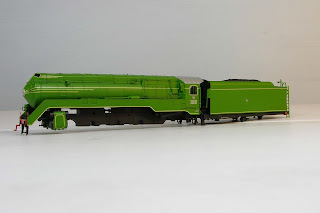 Painted samples of the three liveries (Green, Royal Blue and Tuscan) of the 40 class have arrived and are currently going through our checking process. It normally takes at least12 weeks from approval of the paint samples to delivery and given current delays at the factory a December/January 2009/2010 delivery is likely. For the past week we have had a pre-production CPH/CTH sample with fully functioning sound to play with. We have been having fun fiddling with the model but more importantly we have brought in the experts to listen to the sound and give their opinion. 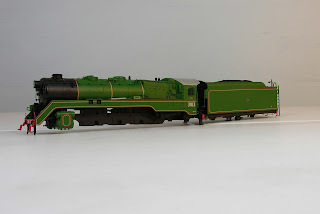 The last two unknowns to worry about in a project are the final running qualities of a model and where appropriate how does the sound come across. Sound is now progressing beyond providing just basic sound functions and listening to the sound associated with passengers boarding including the squeal of the seats being folded over is most entertaining. The only advice to date from the factory regarding delivery is that they are still awaiting components. 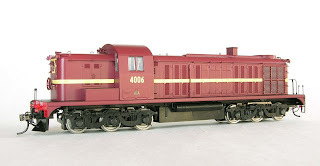 Stocks of CCH wagon packs and the 5 + 5 packs are now exhausted. We have sufficient stocks of LCH packs to last about four months at the present rate of sales. 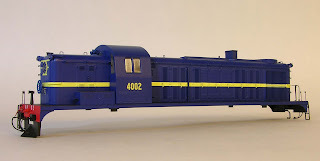 A re-run of LCH/CCH wagons is in preparation and will probably be delivered in conjunction with the RSH project. No delivery date as yet but we are thinking late 2009. Towards the end of any model project the decision has to be made as to the quantity of each paint livery that is to be produced within the context of the overall total run of the model. This is not always easy to do and our approach has been to base the break-up on the orders in hand at the time when the numbers have to be supplied to the factory. With the CPH/CTH it is clear that we underestimated the demand for the Indian Red on Masonite siding variation. In the non-sound version it is almost certain that this variation will the first to sell out as we have less than 20 units left. Similiarly with the C38 we have clearly got the demand for 3801 in Grey wrong. Our initial estimate based on orders to hand suggested that there would not be a large demand for this variation and so we ordered the minimum number. We have now displayed the final paint samples at three exhibitions and orders for 3801 in grey have jumped significantly and it is highly likely that this variation will be the first to sell out. 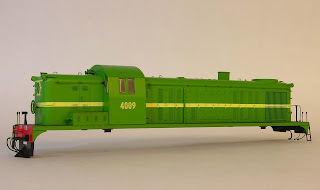 A similiar thing happened with the 620/720s where pre-orders for the Candy livery suggested a low demand which proved to be totally incorrect with the Candy livery experiencing a surge in demand once they were displayed at exhibitions. Sometimes you just can't pick it. Painting and assembly of the 38s is underway and the factory is talking about delivery in ten weeks. This would suggest the last week in June as a date to be late by. You have waited a long time and here they are. 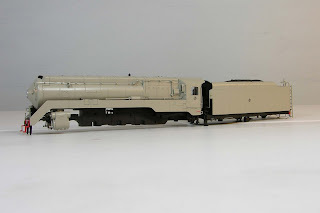 Sorry for the delay in posting these photos of the various paint schemes for the CPH / CTH railmotors. Distribution of the non-sound CPH/CTHs is about half complete as of 30 March. Another week or so should see them all in the post. Ring if you want to check where your non-sound unit is upto. 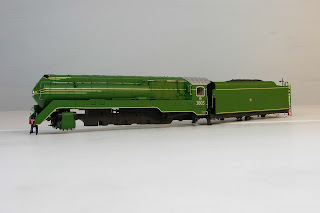 Another package arrived from the factory today containing a full set of painted 38 class bodies complete with all details and in their final paint schemes down to the last detail. Also included was a fully assembled non-streamlined version in weathered black with red lining. Paint scheme looks good but as importantly after much testing the general opinion is that it is a very fine smooth running mechanism. The motor vessel Cosco Fuzhou carrying the non-sound CPH/CTHs is expected to dock at Port Botany this Thursday (12th of March). The cargo should be cleared early next week and distribution of the models will commence immediately. Distribution should take about two to three weeks. Production of the sound boards for the sound - equipped units is underway but no delivery date is available at this time. Word from the factory is that the production run of the non-sound CPH/CTH is finished and is booked on a ship leaving Shenzhen on the 1st of March. 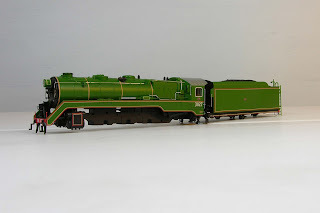 Last seven painted 38 class bodies have arrived and we now have received all 13 paint schemes. These are being checked and when we have confirmed the 13 liveries painting of the bodies will commence. Assembly will commence when the painting stage is finished. Photos will be up on the web-site shortly. Word from the factory today is that assembly of the non-sound CPH/CTHs is well advanced and should be completed late next week. We should then recieve a shipping date. No dates for the sound equipped units yet. At the current rate of sales it is estimated that stocks of LCH and CCH 4 wheel hoppers will last about six months. However, stocks of pack No 3 (LCHs) and pack No 4 (CCHs) are now both down to less than 20 packs. Packs 3 and 4 are back-up packs that provide different sets of numbers for those who wish to run more than 10 of either the LCHs or CCHs. It appears that we have under-estimated the demand for these packs and they will be the first to sell out completely. Whilst at the factory I saw painted body samples for all liveries of the 38 class. They looked superb. I couldn't bring them back with me so the factory has put them on Fedex and I have received advice that they will be delivered Monday. We will check the liveries and assuming they are correct forward our approval to the factory so that when the factory resumes production after Chinese New Year painting and then assembly can commence. This would suggest a delivery date sometime in March or April. I will put photographs on the web-site as soon as they can be arranged. Arrived back in Sydney yesterday (Thursday) and just getting over the jet lag. This was a very succesful (and enjoyable) visit. I have started work on the next edition of The Eureka Times which should be ready for distribution next week. I will also be posting snippets of information here as I think of stuff. 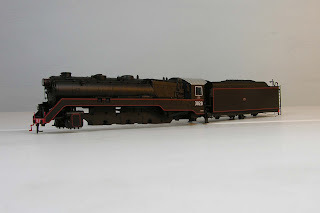 I have two sound equipped 620/720 2 car diesel sets on which the headlights do not work. 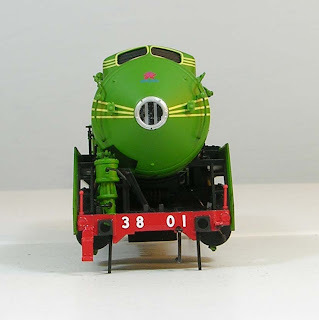 They can be in Early Tuscan, Indian Red or Reverse liveries. They are marked down $94 per set to $400 per set on a first come-first served basis. Preparation of the 17th edition of The Eureka Times has commenced. Production and distribution will be interrupted by a trip to the factory but this visit should produce even more information to incorporate in the 17th edition. At this stage the 17th edition is expected to be available on the web site around 1 February with paper copies in the post shortly there-after. A visit to the factory on Monday the 12th of January has now been confirmed. A wide variety of issues have been listed for discussion and much news should be available on our return. The visit has been timed so that the assembly of the CPH/CTH can be observed. This will be the first occasion that anyone from Eureka has been present to observe the assembly of a Eureka project. The factory will close for Chinese New Year on the 20th but the CPH/CTH should be on the water before then and we expect them to be on the wharf at Port Botany by the second week in February.